Working on movie projects can be challenging to the mind, the body, and the emotions. You spend long hours on set, often far from home, sometimes in extreme heat or extreme cold. You are often concerned that you will run out of time to get the day's scenes done, and sometimes the tension and the physical stress can exaggerate the emotions of the moment. And each day of the shoot brings the cast and crew--often strangers at the beginning--closer together in the shared misery and the unexpected artistic discovery. You walk the walk together, and when you do, you build a bond that can sometime last a lifetime. A beautiful gift. I explained that wonderful process to Carlos, whom I met on the Camino yesterday. He loves movies and told me that when he was younger he dreamed of making them. Were you scared to walk the Camino alone, I asked him. He nodded, with a smile: "Definitely". He said he was happy he took the risk, though, because he has met people who have helped him look at things in a new way. But then, we both acknowledged, you part with them in an awkward and sometimes sad way, and there is a good chance you will never meet one another again. It's like a movie project, I said. Sometimes you cry at the end. It can get very emotional. But the moments you shared often stay with you forever. I think they're often more important than the film which you have all helped create. It has happened to me many times, and I'm very grateful. It made me think of all the people with whom I have shared my life over the years. They're often associated in my mind with chapters of my journey: my growing years with family and neighborhoods friends; my high school trials and triumphs; adventures in college at Georgetown; work experiences in the 'real world'; the Jesuit chapters in Philadelphia, Fordham, Georgetown, Cambridge, NYU, Fairfield, Staten Island. If you meet me today you meet all the people who have taught me, tried me, and touched me, and whoever I am today is to a good extent, their fault. We are all so complex. Like onions, we are layers and layers of sometimes conflicting experiences and influences, simultaneously embracing and rejecting our strengths and our faults,and if we take the time to try to know one another just a little bit, we will discover the beauty and the vulnerability that is in us all. In the end, I believe that we all of us want to be known, and that we want to be one with each other. But to get there we have to take the time, and the risk. It is definitely scary to walk that road, as my friend Carlos--and I--admitted. I thought of St Ignatius, the founder of the Jesuits, and his companions, who inspired me to take my first big risk on a road I am still traveling. 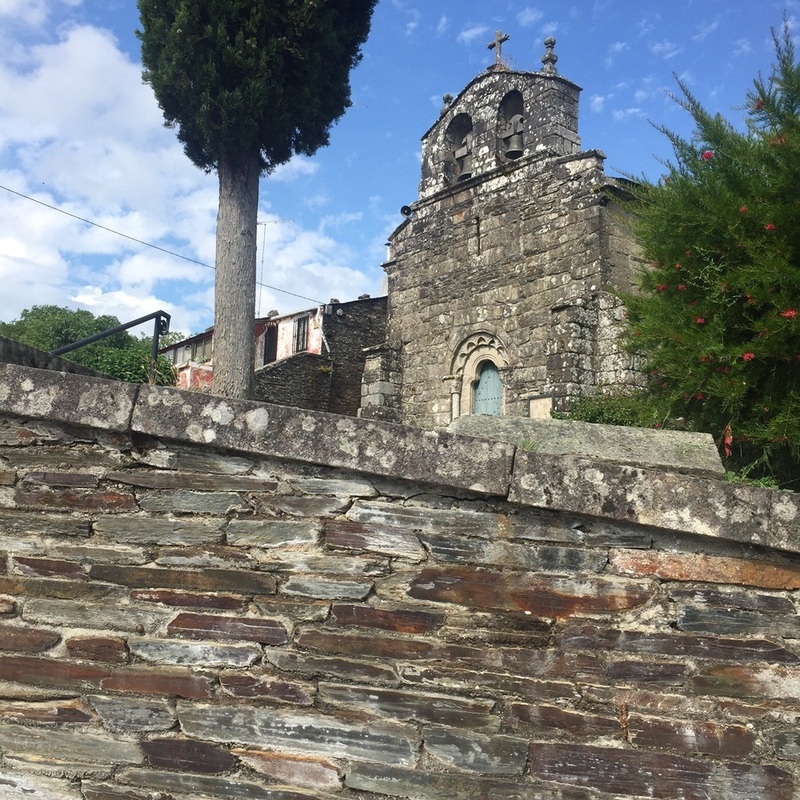 We spent the day walking under intermittent sunshine through the region of Galicia, to a little town called Baamonde. I was reading that Galicia has a history of losing its residents, and that lots of the small towns have been emptied. Fidel Castro's parents emigrated from Galicia to Cuba. Just as we were leaving Vilalba, we met a man who was Hungarian, out walking his dog. I asked Carlos to tell him that I was half Hungarian, and he immediately started speaking to me in... Hungarian. I shrugged, as I do with the Spanish. The walk was relatively gentle with lots of roses, no large hills, and it was stressfree--except for the dogs. They were everywhere, protecting their masters' properties, sometimes gentle, sometimes ferocious. 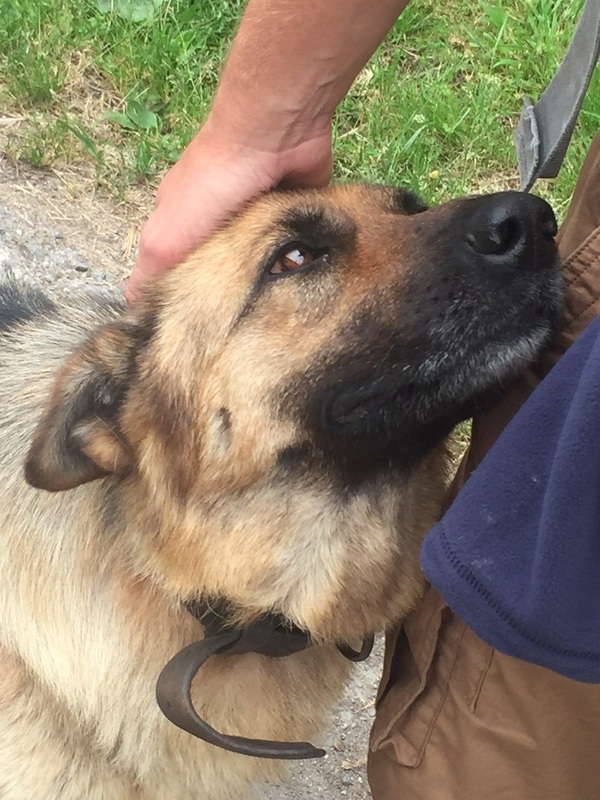 Lots of German Shepherds. To be truthful, the conversation between Carlos and I was non-stop for the entire 6 hour walk. As soon as we met in the morning --he stayed in a dorm-style Albergue and I stayed in a relatively humble pensione--we began to talk. I think both of us were surprised by the levels of our lives that we shared, and I was deeply grateful for it. 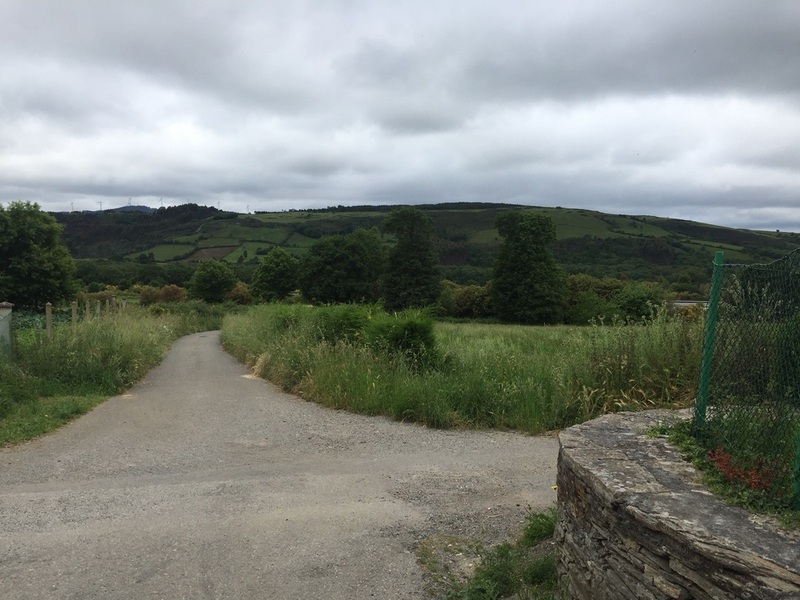 At one point Carlos suggested that he wasn't sure what to do for the next few days-- he indicated he enjoyed our bond, but he also felt it was important that he have more time alone on the Camino. Ah, I said, of course. I felt a little like a parent, giving him permission to be free, and to embrace his need to solo. I know that road, and in many ways I need it too. So we may meet tomorrow to walk a bit more of the Way, or we may not. Regardless, we will continue to walk together as companions in the larger search of our lives. Day sixteen. Cloud of unknowing.